Flyers hate being packed ever-more tightly like sardines in a tin, but that’s where we are today. In October, American Airlines revealed that it will insert 12 more seats, or two rows, into its economy class on its Boeing 737-800 fleet and an extra nine seats into its Airbus A321s. At the same time, JetBlue said it will cram 12 additional seats into its A320s. Then just yesterday, The New York Times asked how much farther can airlines push for higher profits by ‘densification’ before causing a backlash? * Neither Boeing nor the Federal Aviation Administration will disclose the evacuation test data for the newest (and most densely seated) versions of the most widely used jet, the Boeing 737. 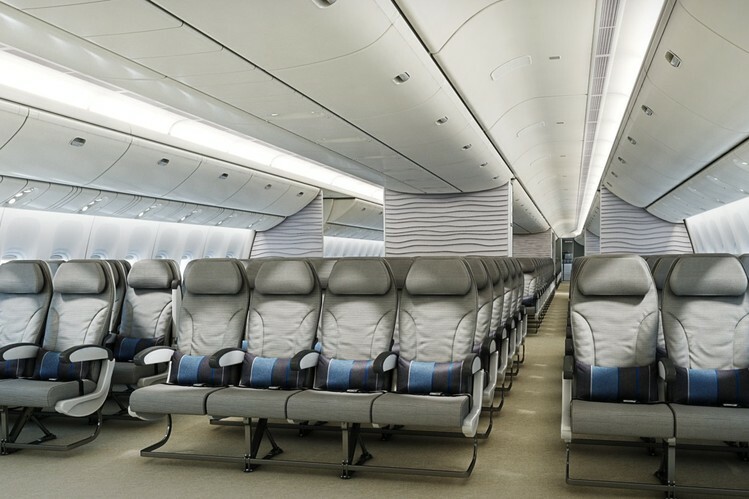 The Boeing 777 Economy 10-abreast seating will have two middle seats in the center section, instead of one. FlyersRights brought a case that was heard by the U.S. Court of Appeals for the District of Columbia Circuit, where a judge said there was “a plausible life-and-death safety concern” over the “densification” of seats in economy class. The court also ordered the Federal Aviation Administration (FAA) to respond to our petition about how to deal with safety concerns due to the shrinking seat sizes. Further, the court criticized the FAA for using outdated studies to argue that no change was needed for emergency evacuation tests. Meanwhile, at the same time, seat manufacturers are racing to come up with ‘innovative designs’ in densification by shaving down every possible angle to please the airlines – by removing the seatback pocket, replacing padding with mesh and narrowing the armrests. Gone are metal frames with thick cushioning. The motivation to tighten space between rows of seats is occurring as the US major airlines are opting for 10 across in the Boeing 777s – instead of the previous nine abreast, so the middle section will have two middle seats, instead of one. As masters of fine-tuning passengers’ misery into profits, the airlines are quick to say that packing in more seats is ‘necessary’ to keep fares ‘low’, while touting Business class as the alternative. Although, the price difference between Economy and Business is often in the order of several multiples. But in reality, few words have more debunked than this. FlyersRights.org has filed Freedom of Information Requests to smoke out exactly when and how the FAA has tested seats for emergency evacuation rule compliance (90 seconds with half the exits disabled in low light conditions. This is required by an airliner in order to provide service to the general public. Latest revelation– Last time an actual full test was conducted was in 1988! Since then, FAA has accepted “analysis” in lieu of testing as presented by airliner manufacturers.